Dugway Brook travels from Cleveland Heights into Cleveland and is part of the Dugway Brook Watershed. The Northeast Ohio Regional Sewer District manages the nine mile watershed basin in Cleveland. Attempts to eliminate external pollutants to the drinking water result in the culverting almost the entire brook. In 2004, Nerone & Sons, Inc., on behalf of NEORSD, contracted Metal Craft Docks to build a 5×15 aluminum gangway and (1) section of 5×15 aluminum truss floating dock for use at Dugway Brook. Truss or frame floating docks are great in applications where the water levels fluctuate on a regular basis. Each of our aluminum dock sections connect with either locking plates or hinges for rigid or loose connections. Today we make our truss frame floating docks with hoop pile holders, floating dock piling rollers, and polyethylene flotation making them environmentally friendly. Each section is made of aluminum extrusions and feature an aluminum decking with poly acrylic, non-skid finish for safe footing. 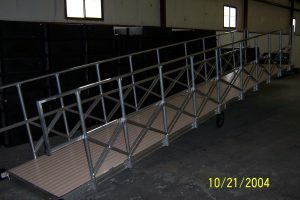 Additional accessories include dock handrail, retractable dock ladders, dock cleats, dock rub rails and solar dock lights. Contact Metal Craft Docks today to discuss your commercial dock needs. Metal Craft Docks has been designing, engineering and manufacturing dock systems for over 80 years! Municipalities, government entities, and organizations continue to choose Metal Craft docks due to our quality products in demanding applications. Metal Craft Docks is a family owned and operated business priding ourselves on exceptional quality, design and outstanding customer service. We are proud of the craftsmanship that goes into every one of our products manufactured in our Painesville, Ohio facility. When you purchase a Metal Craft Dock and Lift you are making an investment. We know you will be happy with your Metal Craft purchase for decades into the future!